Twitter can be used as a marketing tool or a promotional tool if used in the right way. Therefore, it is very important to perform some analysis on your account and your competitor’s account to understand how to best develop your brand, gain new followers that will eventually translate in sales for your business. This tool allows you to track the most interesting recent follows and favorites of 3 handles of your choice for free. This is the right tool if you want track passive signals on Twitter. 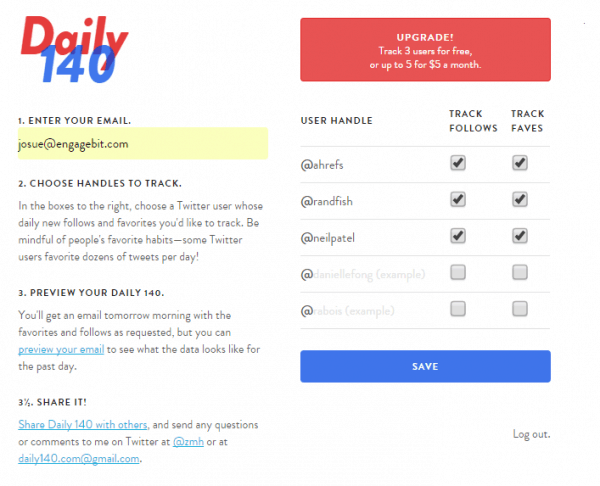 Find three people on Twitter (whom you want to track), and Daily 140 emails you each morning with a list of all the new followers and the tweets they have favorited. 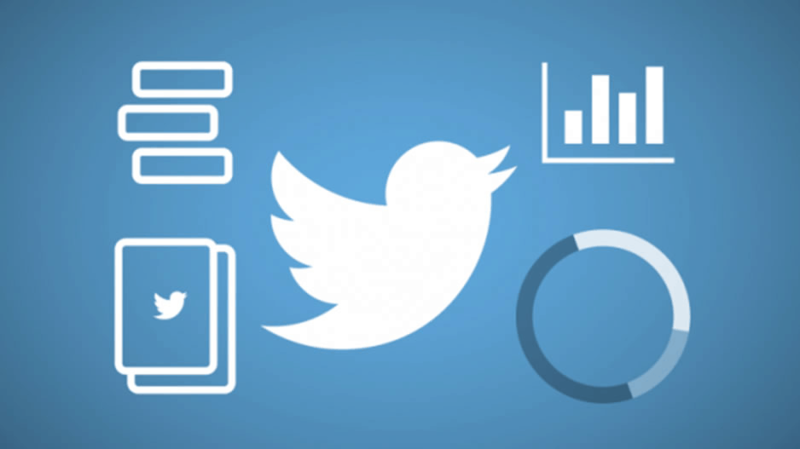 Find this tool assists you to find your Top 10 tweets, ordered by engagement. It is an analytics tool that analyzes your followers and activities. It is one platform that analyzes everything on Twitter. 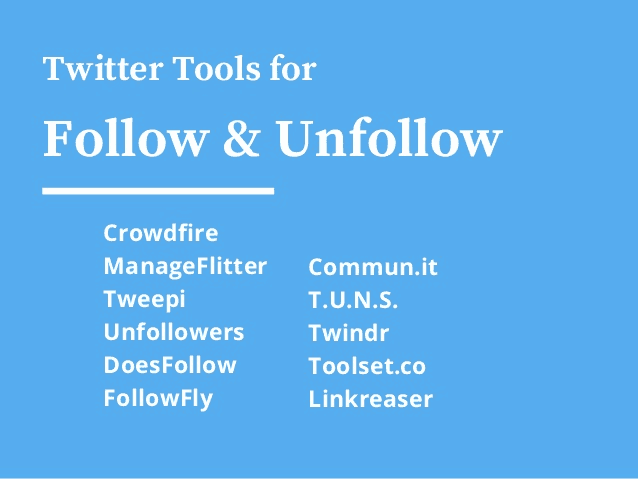 The free plan package entails follow/unfollow tools, analytics, the best time to tweet and community segmentation. 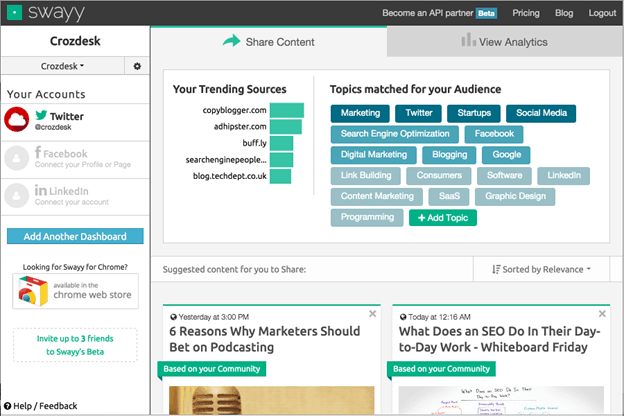 It is a free tool that allows you to engage with your audience and helps you in analyzing. You can analyze anyone’s account through Riffle, it gives you a breakdown of their activities like retweets and favorites. This way you get to discover connected profiles, popular hashtags, statistics, most shared links and many more. 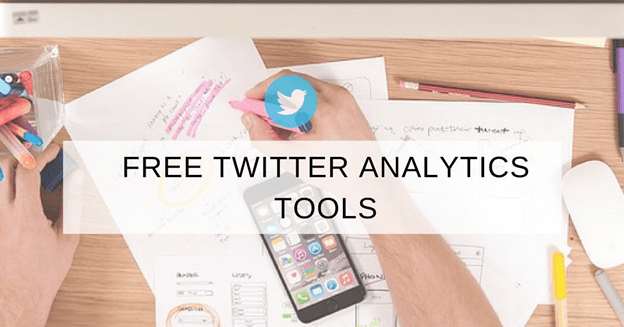 It is a very comprehensive and detailed Twitter analytic tool that is used to analyze your competitors’ account or your own account. Twitonomy helps you to search, filter, get insights and analyze tweets, retweets, replies, hashtags, mentions, engagement and more. It is a free analytics tool that makes multi-channel analytics management easy. Add your Twitter to SumAll, and you will receive weekly or daily emails on your followers’ growth and engagement. 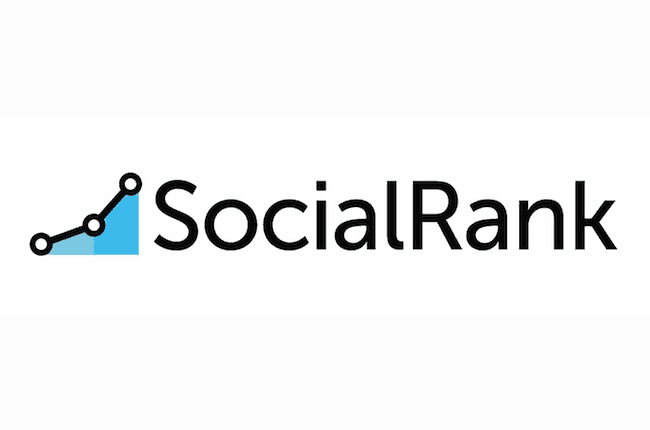 SocialRank allows you to track your followers and following to engage with on Twitter. It helps you find the most valuable or most engaged fans. You will receive a list of most influential followers, best followers and most engaged followers. 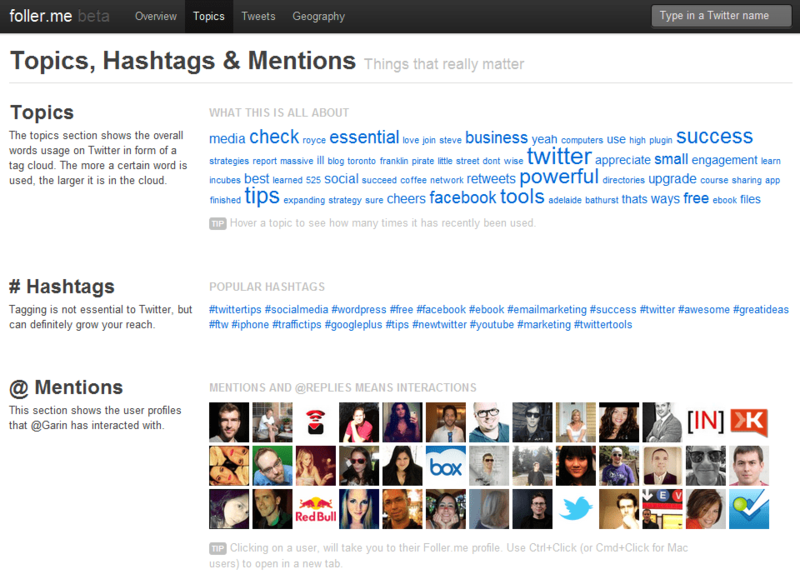 You can also apply filters by location, company, activity, hashtags and more. Klear analyses your followers and your profile once you connect it to Twitter. It feature allows you to identify influencers within your niche, who to follow, location and many more. This analytics tool enables you to picture your interaction on an interactive detailed map. 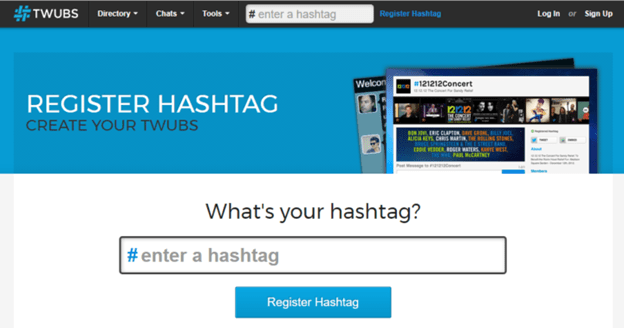 Type in a hashtag or a username and get to see the community around the user or influencers. It is yet another free tool that gives you great insights about your Twitter account. It gives you geolocated tweets for hashtags/keywords and Twitter analysis for your accounts, tweeps or new potential follows. Stats for Twitter: Visual breakdown of all Twitter Stats. It is a nice IOS app that analyses your Twitter account and other Twitter users or your Competitors. This tool gives you a visual break down of all kinds of Twitter stats. Beatstrap allows you and your team to cover live events like sports, news and offline discussions through Twitter. 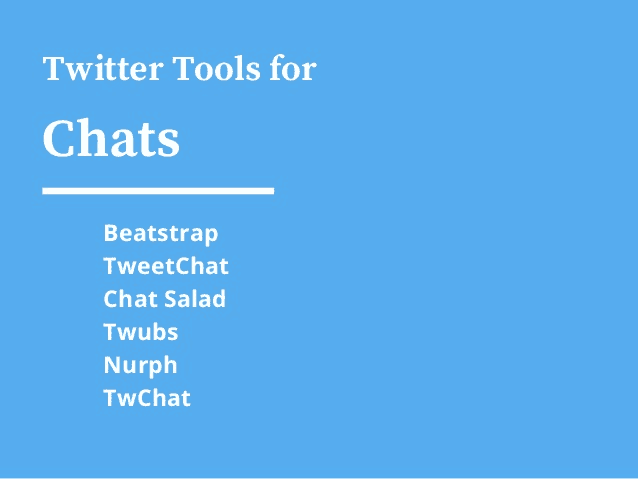 Tweet chat is a tool designed just for Twitter chats. You just have to login in to follow a specific hashtag using your Twitter credentials. You will get chat in a room which accumulates the hashtagged tweets for you and definitely you will get to reply to them. This tool allows you to see scheduled Twitter chats, upcoming ones and hashtags normally used in those chats. It is an effective tool where you can send your audience. It is effective for small groups, Twitter chats and conferences. It gives hashtag users the power to contribute their own content. Twubs can be used to schedule chats, find relevant chats and conversations that interest you and host Twitter chats. You can register your hashtag for your chat and follow or view it from one place. Nurph enables you to be alert in real time chat replays or pause a Twitter stream. It plans and organizes your chats with follow-up stats and replays. TwChat is for people who like participating in Twitter chats. You can sign in through your Twitter account and then create a profile. Afterwards you can submit a hashtag, start your own chats, see tweets with questions, bookmark hashtags, filter hosts’ tweets or follow specific chat room. Nuzzle is the killer App for news consumptions. Nuzzle will allow you to see what content is mostly viewed and shared on social media just by Logging in with Twitter. You will discover what your followers and following are talking about; it is all about what is trending within your audience plus the popular links. It ensures that you have your best top content that interests your audience. 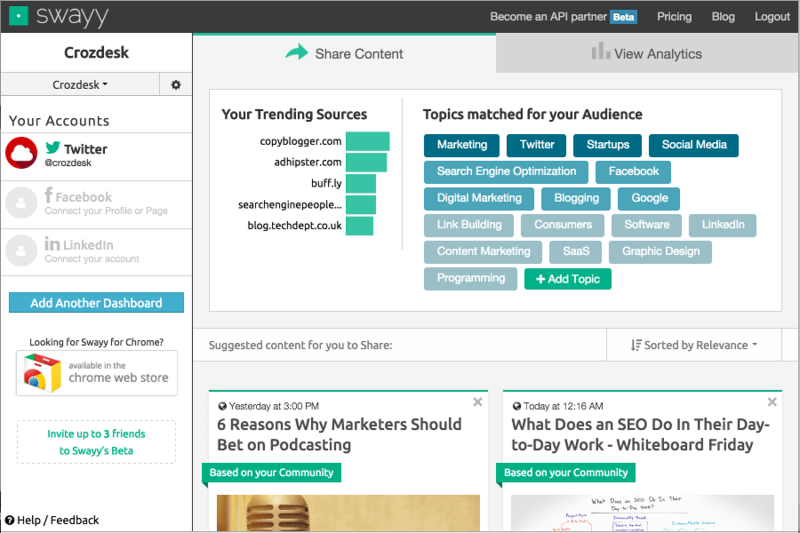 It has the ability to identify which content is working and the major influencers. Since these influencers are your target market for your campaign. You can view what your followers are interested in to match your brand’s image via the dashboard or a daily email digest. You can share photos on Twitter in many ways but how many ways are available to search through photos shared? Twipho is the answer. Twipho is a search engine that allows you to search the trending photos or images shared by others on Twitter. Interested and engaging links from influencers or interesting people are constantly updated. 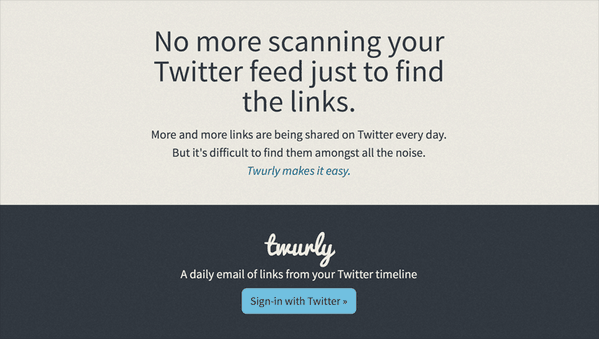 Twurly makes it for you to view links from your feed. You will not have to scan just to find the links when you are using Twurly this is because you will receive daily emails containing the best links in your email. This is made possible since Twurly has scanned the page authority and popularity of the links. Brook sends you a daily email of the five best tweets from the Twitter users you choose. 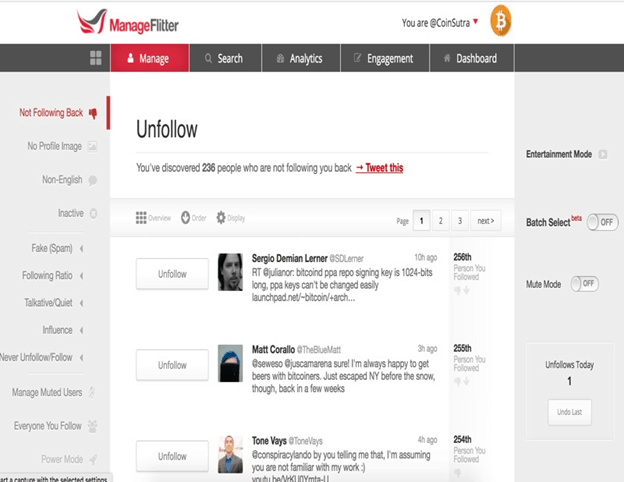 A tool to manage your followers. It assists you to connect to the right people and grow your audience by viewing who recently followed you, who followed you back and also build a list of accounts you wish to follow in the future. Give it access to your Twitter account and it will sort your followers by things like location, last tweet, spam accounts , language whether they will follow you back but it will not tweet for you. One of its features allows you to pick multiple Twitter accounts with one click. It is used to flush people who do not follow you as a way to get rid of inactive follows. It also allows you to follow someone else’s account followers in bulk. It gives you a detailed list of who you follow and unfollow with ease. It is one of the simplest tools to know who follows who. Does person X follow Y. It assists you to know whether certain influencers follow other influencers. It has all sorts of features to help in finding valuable followers/influencers, how to engage them and your social position on Twitter. You can also see the activities of your followers- top tweet and influencers. Sends a notification that someone unfollowed you plus who they are and their link to their profile; this app is completely free. It shows a list of followers’ profile and then you can decide by either unfollow- swipe left- or keep following them- swipe right. It is currently available for iOS users. The free plan allows you to have 75 actions per day; see who has unfollowed you, unfollow unfollowers back, recent flowers and unfollowers, reciprocate your followers’ followers and other actions. Helps you find the right users based on keywords. 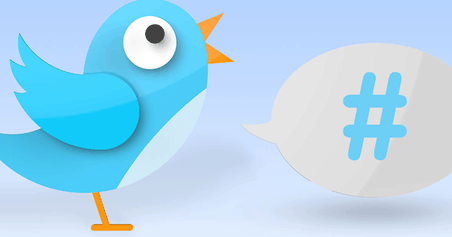 Connect your Twitter account with FollowFly, it will skim your posts based on interactions that both of you share and you will find interesting content and beyond Twitter. It analyses new keywords based on engagement and popularity that is hashtags that are mostly liked, retweeted and clicked on. See related hashtags, usage patterns and recent conversation as a way to tag your tweets and identify new opportunities. Gathers all social media posts and content related to a particular hashtag then rank the results. It functions as a PageRank. It collects recent texts, videos or/and images related to a particular hashtag on the social media platform. 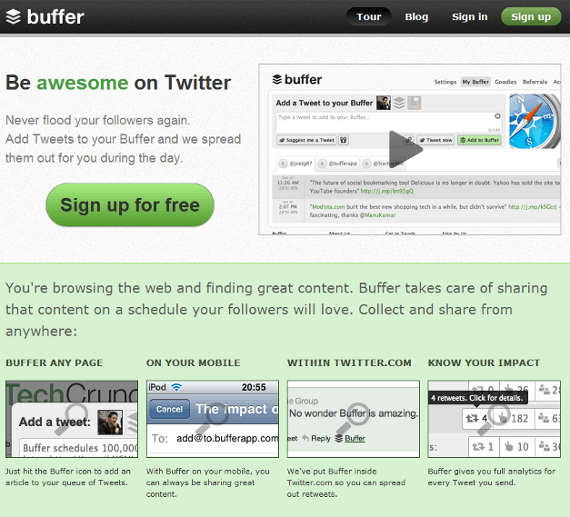 It is a tool built by Buffer. It lets you quickly build images with beautiful frames and backgrounds and add texts and logos to your image. It has a library of over 5000 images with its components-fonts and colors. It is a quick a simple tool for creating eye-catchy images. 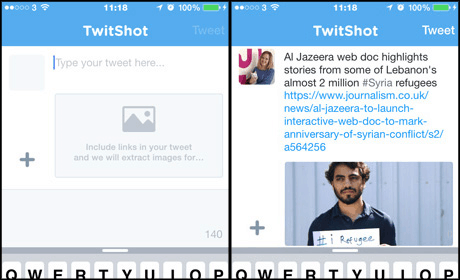 It lets you pull any image from the web and attach the URL to your tweet. To use this tool add your tweet with the link of chosen website and Twitshot will abstract images from the webpage. You have to highlight preferred text on whatever website and click Share As Image bookmarklet to stick the text on he preferred image. Turns Twitter into a river of never-ending photos. It keeps you a loop on what is going on on Twitter. Get an email alert every time your keywords, phrases, @mentions, brand name and hashtags are mentioned. Keyhole helps you track conversation every time your name, URL or a specific hashtag is mentioned- it will notify you. It monitors keywords as they are tweeted in real time and places. You can zoom-in a geo-targeted area. It tracks keywords and sends you an email when they are mentioned. It is a great tool when you want to track and interact every time your brand, product or/and name is mentioned. 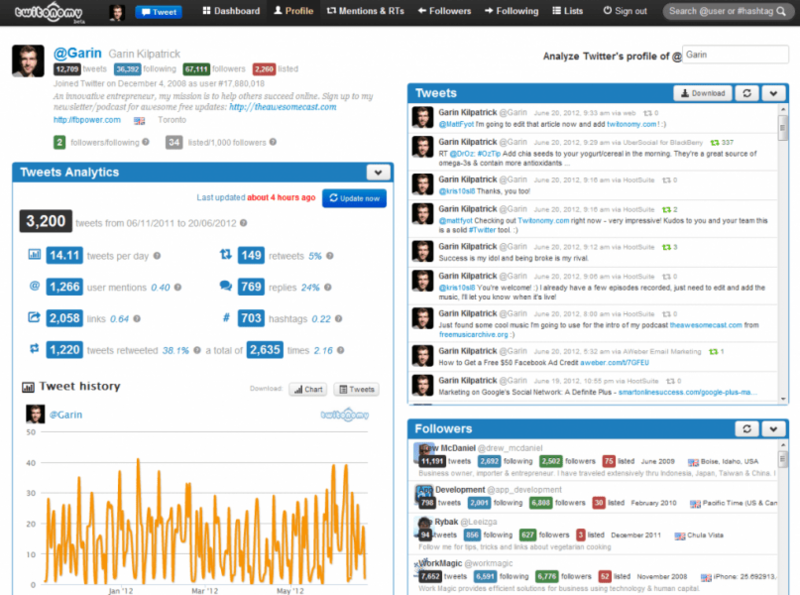 It is a listening tool for monitoring all your mentions across all social media. It is a great way to locate your clients or followers easily. 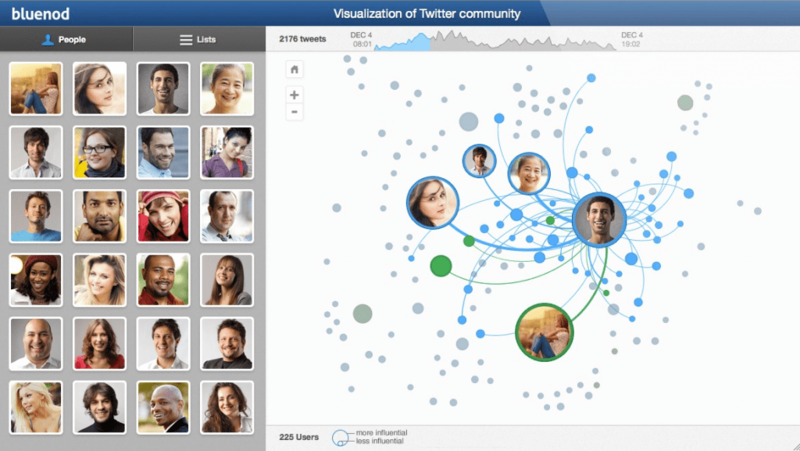 You can easily get a visual of what is happening around your customers, events and conversation. It gives a page of relevant influencers’ account, tweets when you search and track hashtag, username or any other keyword. It is used to schedule your tweets and distribute them for the day—analyze their performance and identify stories to share. It will schedule your tweet and send it for you when you send a direct message to the Tweet4me account. It is advisable to use prefixes and shorthand and prefixes to indicate when to share. A simple tool that allows you to know when is the best time to tweet. It analyses your tweets and that of your followers to find the best time to tweet. 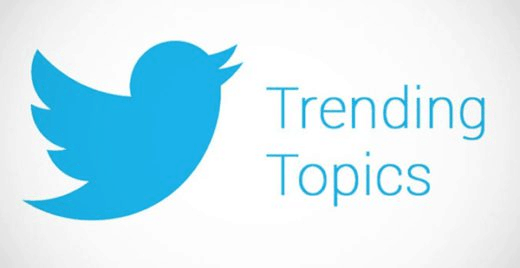 Trends24 assists you to increase your engagement by seeing what is trending and hashtags mostly used. It lets you see a comprehensive trending terms for the last 24 hours; it is segmented into country-by-country and hour-by-hour. You can use it for your geolocation and timing research and social media campaigns. Just a simple click and you can see popular keywords and hashtags from anywhere in the world (where you prefer) through a zoom-in map. With Trendsmap it helps you to identify local trends. iTrended satisfies your curiosity to see if certain keywords or hashtags trended in the past 15 days. It lets you manage multiple profiles and sends DM and also allows you to have multiple interactions with a single click. Mac OS X Twitter clients can view incoming tweets, searches, and lists distributed across multiple tabs. View activities- tweets- of particular friends you want to hear from via an inbox-style layout with nested updates. It has features like color-coded timelines and muffled keywords or hashtags for iOS users. It lets you connect your business with friends, community and clients by letting them know what is being said about your business through analytics, account management and many more. An app that brings the key talking points in a day.Get to know what key topics people are talking about today in real-time. And also which keywords or hashtags are getting most tweets, and the ones getting most attention. 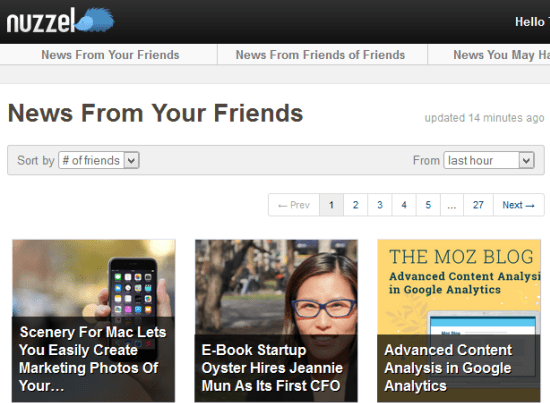 To see share number per articles, type in a URL. 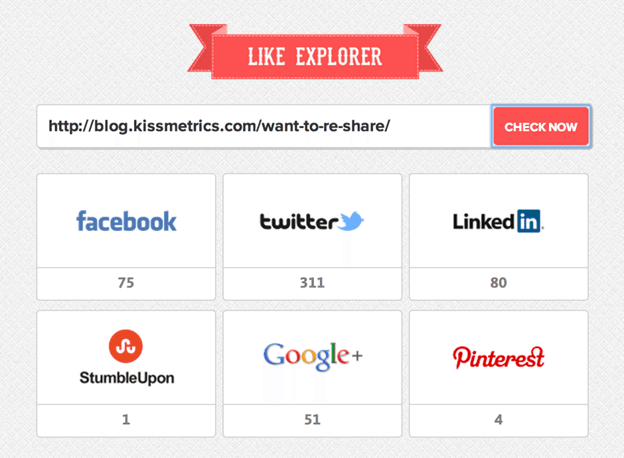 Just type in any URL and check the share numbers on different platform: Twitter, Pinterest, Facebook, LinkedIn and Google+. It automatically shares your tweet when you post an article. You can curate your tweet to show the heading of the new post. Find out when someone joined Twitter even if it is not written or written on their profile. They both have the same function but Zapier doesn’t have as many free options as IFTTT – If This Then That-. They both let you share your posts to your networks like posting your Facebook status on Twitter or posting your Instagram photos on Twitter. You can also connect multi-social accounts to your Twitter account. As a marketer or influencer you will never want to lose your engagement with your audience. Be Present lets you know how quick are you in responding tweets.It gives a report on response rate, your response time; an overview of how fast you respond to Twitter. It gives any tweetable sentence from any article when you install the bookmarklet. It works if you have a team or community and operate with one account. GroupTweet allows you to add and remove contributors as many times as you like. You do not have to share your password with any of your contributors. Most importantly it can be used a private group conversation. It is a smart way telling stories through Twitter; assemble any number of tweets and put it in a Storify Collections and then you can share them. Do you want to know which topics an individual tweets about most or which influencers are mostly mentioned? It lets you discover most used words (by you and any other user).what you have to do is type any user account on Twitter to know which topics a person tweets about mostly. You can listen to the sentiments of tweets of any keyword via audio track base. It is an awesome cool tool that enables you to market your campaign on social media. If you are in the entertainment industry or event industry definitely this is the right tool to use. Start any campaign through Thunderclap and it will automatically send your message to thunderclap Twitter account holders. You can live-stream any video with whatever you want or up to in Twitter. If you want to drive traffic to your website, just write what you want (your tweet) to share. Your audience will then click the tweet to share alongside with the link to your website. It assists in getting your audience to tweet your content on a website or blog post. It has a wide range of fancy fonts and styles to use in your tweet text—just Unicode characters. It makes it easy to tweet quotes or images. Why should you use Pullquote? It simplifies tweeting quotes or images easy– You can share any text quotes from any webpage. You can use it as a bookmarklet. Sharing niche content is very easy. Simplifies collecting quotes and marking online materials. Available as Chrome extension, bookmarklet and iOS app. Find out the story’s origin; get to know who the first to tweet about it, was. 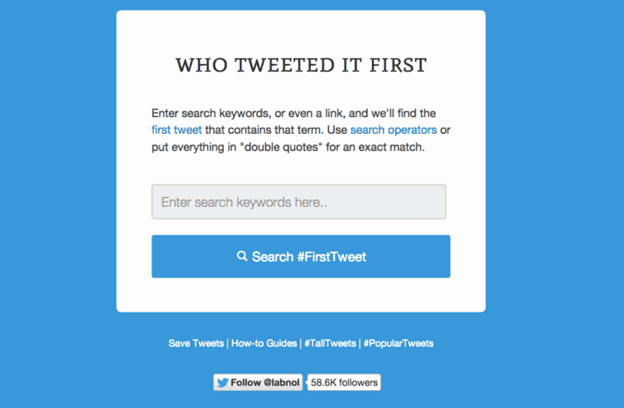 Enter keywords or links in “double quotes” and get to know who was the first to start a trending topic or hashtag and who was the first to share a certain image or video. The app is currently available on desktop. Write as many characters as possible and Little Pork Chop will chop them down into sizeable Twitter characters and later post them one by one. It will email you, to remind you to follow up on your favorites. Nudge enables you to back-up tweets so you can revisit later. It will remind you to engage on twitter through tweets you saved for future follow-up. It is a stalking tool developed to help Twitter users to monitor closely 5 Twitter accounts. Every time they post an image or tweet, you will receive an email. The five chosen tweeps will not be aware if he is being closely monitored only the Social Hunt user and the Social Hunt tool are aware. No more scrolling up and down your Twitter feed in search of a particular tweet. Twitter bookmarks is a kind of ‘save it later’ feature- as a way of saving tweets they like and might revisit later by not necessary liking it. The benefit of using this feature is that it is only viewable by you; the sender is not aware of the saved items. It is available on Android, mobile Twitter website and Twitter Lite. 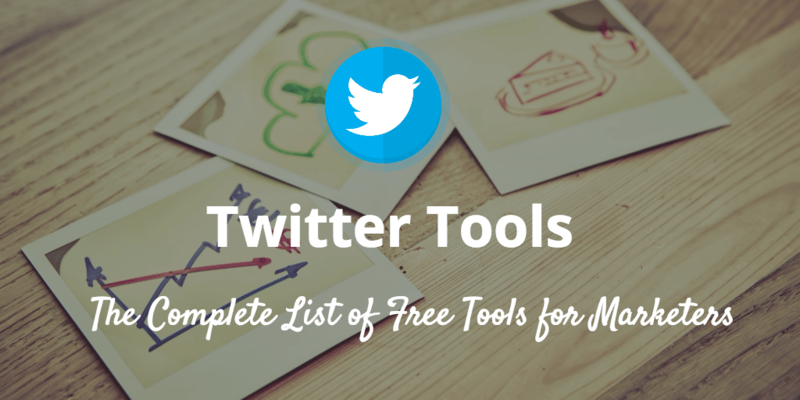 Twitter tools are endless and more are being built-up just to make your work easier and get on top everyone else. 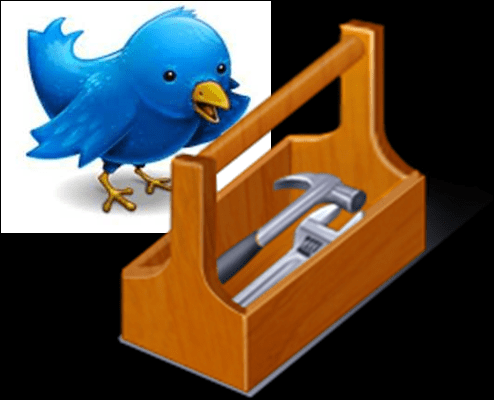 Hopefully, the listed Twitter tools will be effective and useful for your marketing campaigns.